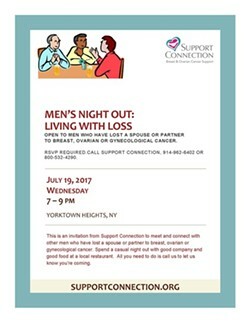 Support Connection invites men who have lost a spouse or partner to breast, ovarian or gynecological cancer to meet and connect with other men who have experienced a similar loss. Spend a casual night out at a neighborhood restaurant in Yorktown Heights, with good company and good food. Pre-registration required.